Competition between supermarkets can get pretty fierce but every now and again a promotion designed to get customers through the door backfires. According to this site Waitrose may have scored a bit of an own goal by adopting a free coffee loyalty card. The high-end supermarket currently offers a free cup of coffee or tea for customers holding a myWaitrose loyalty card - even if they don't make a purchase. Angry shoppers used Facebook and Twitter to vent their frustration, arguing that handing out free drinks is turning Waitrose into a soup kitchen and the stores are packed with less affluent customers, which is putting some customers off. One Facebook user wrote on the supermarket's page: "Please stop the free coffee at Barry Waitrose, it is putting me off shopping in the store people are coming with two cards two free coffee no shopping, with their Tesco bags. "I think seeing people walking round the store holding on to takeaway cups of tea and coffee looks quite ridiculous and brings down the image of Waitrose until it is just like everywhere else – in which case I might as well shop anywhere else." Another angry shopper said: "Bit disconcerting seeing people carrying cups of hot coffee around Waitrose whilst they text and push trolleys with their bellies." It is enough to make me want to find a Waitrose store and demand my free drink. The Western Mail reports on a ruling by the Independent Remuneration Panel for Wales that will allow unelected members of the public co-opted on to council committees to claim more money in the New Year. At present all 22 local authorities in Wales have people who are not elected councillors sitting on at least one committee. Most commonly these include independent members of Standards and Audit committees, but unelected individuals also sit on some scrutiny committees. In its 2012 annual report, the Independent Remuneration Panel for Wales expressed concern that current arrangements may be too restrictive. From January 1, therefore, the maximum commitment of 10 days per year will be scrapped, and councils will be able to set their own higher limits if they want to. The panel also recognised that time spent on attending authorised training events, conferences and pre-meetings with officers can be part of the functions for which co-opted members can be paid. * Meetings eligible for the payment of the fee include other committees and working groups, including task and finish groups, or any other formal meeting to which co-opted members are requested to attend. One former Council Leader has estimated that this could cost Council taxpayers around £535,480 a year across Wales at a time when all authorities are seeking to cut millions of pounds from their budgets. The timing is not good, but the principle too must be questioned. Independent members can be very useful on Standards and Audit Committees, but it is the job of elected Councillors to scrutinise the executive. They are accountable for that work, unelected members are not. The proliferation of co-optees onto council committees is in danger of undermining the democratic process. To them pay them on this basis is utter nonsense. According to this piece in the Independent Nick Clegg would accept Ed Balls as a member of any coalition cabinet after the next election. It is not clear whether Ed Miliband is of the same view. It seems to me to be somewhat premature to be talking about these issues given the current state of the polls and the fact that we still await the verdict of the British electorate on coalition politics per se. It is likely in my view, that both Ed Miliband and David Cameron will spend the election trashing the idea of coalitions in the hope that they can persuade voters to give them a majority. Both will use the unpopularity of Nick Clegg to reinforce their view. Policy demands Mr Clegg is likely to make include extending the pupil premium, a flagship Lib Dem measure introduced under the coalition, further tax cuts for low earners and a better deal for the environment. They are also preparing to push hard on the case for electoral reform, despite the disastrous rejection of the alternative vote (AV) system in a referendum in 2011 and the failure of House of Lords reform, two key items on the Lib Dem wish list in 2010. Mr Clegg wants to see proportional representation (PR) in local government, which senior sources say could be introduced without the need for a national referendum, unlike the AV vote. As the additional member system, a combination of first past the post and PR, is already in place in London Assembly, Scottish Parliament and Welsh Assembly elections, the Lib Dems do not believe voters would object to the idea of PR in local elections because it would not constitute a "huge leap". However, the Conservatives are staunchly against any form of PR voting – despite a report by the Electoral Reform Society last month showing that the Tories could gain a stronger foothold in north of England councils under PR. Labour would get more council seats in the South outside London, where they are currently at their weakest. Crucially, Mr Miliband is said to be receptive to the idea of PR in local government, and this could ﻿clinch a Lib-Lab coalition. Let us hope that we are in a position to get these policies into the programme of the next government. Anybody who thought that Labour had moved on from its more authoritarian tendencies need only to look at this article in the Independent to find otherwise. The former Home Secretary warned that the line between comedy and politically-motivated abuse was increasingly being crossed on programmes such as the BBC series Mock The Week, which may require tighter regulation as a consequence. Satirical programmes are subject to the libel laws in the same way as any other of course so I am not entirely clear what Blunkett means. Is he suggesting a different sort of libel law for satire? Meanwhile, another Labour MP is complaining that Thomas the Tank Engine needs more female engines to encourage girls to become train drivers, ignoring the origins and cultural placing of this particular programme. The joke doing the rounds on Twitter is that UKIP are calling now for the Wombles to deport Uncle Bulgaria. Today's Guardian reports on an opinion poll that reinforces what many of us have known for some time, namely that people are angry with politics and politicians and as a result they are not voting. Asked for the single word best describing "how or what you instinctively feel" about politics and politicians in general, 47% of respondents answered "angry", against 25% who said they were chiefly "bored". Negative sentiments vastly outnumber positive, with only 16% reporting feeling "respectful" towards people doing a difficult job, while a vanishingly small proportion of 2% claim to feel "inspired". When Harold Wilson won the 1964 election, more than three quarters of people cast their vote and turnout was roughly equal across the generations. But according to data from Ipsos Mori, at the last election 76% of over-65s were still voting, while only 46% aged 18-24 were going to the ballot box. Rage is the dominant sentiment across just about every sub-stratum of the electorate, but is especially marked among men, northerners, voters over 45 and the lower DE occupational grade. Labour voters, too, are disproportionately cross. But supporters of Ukip, the party that put itself on the map in 2013 with big gains in local elections, reflect the mood of the times most intensely: more than two-thirds, 68%, say the thought of politics and politicians makes them more angry than anything else. Deborah Mattinson, a former pollster to Gordon Brown and now an expert at BritainThinks, believes politicians have not begun to grasp the scale of the problem. "Voter disengagement is getting worse and worse," she says. "Nobody is really taking it seriously enough." Recent high-profile celebrity interventions on the subject have served to underline the growing disconnection. The former England footballer Michael Owen told the Guardian for the paper's series on voter apathy that he had never voted. Russell Brand expressed the disaffection of many in October when he told Jeremy Paxman on Newsnight that he had never voted because he "can't be arsed", adding later: "The only reason to vote is if the vote represents power or change. I don't think it does." After the interview, which received more than 10m hits on YouTube, Paxman said he understood Brand's decision, dubbing Westminster politics a "green-bench pantomime … a remote and self-important echo-chamber". Reflecting such sentiments, the polling shows that ennui is more marked among the young, rivalling fury as the dominant feeling about politics among voters aged 18-24, who are evenly split 34%-34% between boredom and anger. Boredom is marked in one other group, too – those voters of all ages who admit to being unlikely to vote. But even among those who rate their chance of turning out as four or lower on a 10-point scale, the angry marginally outnumber the bored, by 41% to 40%. When asked what puts people off voting, the cause of that anger is the perception that politicians do not keep their promises. Nearly two voters in every three, 64%, nominated the failure of governments to honour their pledges as something that would put them off casting a ballot – higher than any other factor. People are still talking about politics of course, but their interest is in the issues not the petty wrangling. Many are put off by corruption scandals and abuse of privileges, which for all the fuss of a few years back, does not appear to be going away. Nor will it whilst some politicians continue to legally milk the system and resist reform. Many still do not get it. The other problem is in people thinking that politicians are all the same, and in many ways they are right. We are caught up in consensual morass, all seeking to appeal to a limited number of floating voters in a few key marginals. Attempts to differentiate ourselves flounder against the rocks of a disbelieving public as increasingly desperate promises to freeze energy prices or to ignore the economic realities and increase public spending are seen as nice to have but completely unrealistic. It just adds to the impression that we will say anything to get elected. This is not to say that it was different in the past. It was not. What has changed is the level of scrutiny of politics. The decision to bring television cameras into the House of Commons chamber was an important step forward for accountability and transparency, but who can blame the public for not liking what they saw? Newspapers, television programmes, radio shows and other media, including blogs are no longer bound by the self-imposed conventions of the past. They have a 24/7 agenda and huge amounts of space to fill. They are either doing so by exposing scandals, real or imagined, or they are boring us silly with endless political debates filled with talking heads. If you believe that I am writing as if I have a solution then you will be wrong. I think I understand the problem but I do not have a clue what to do about it, how to re-engage voters. Maybe a more representative voting system will open out political debate and give people a greater choice. Perhaps stricter rules and a new culture of openness will eradicate abuses. But how do politicians win back the confidence of people? Will time be a great healer? I have not got a clue. In a significant development the Western Mail has secured a long-overdue apology from the Labour Education Minister for the Welsh Government’s failure to reverse sliding school standards. The paper says that the apology comes in the wake of the damning assessment of Wales’ education system by the OECD, which ranked Welsh teenagers well below those in the rest of the UK on key skills. Wales came 36th for science, 41st for reading and 43rd for maths in the latest Programme for International Student Assessment (Pisa) study. Mr Lewis, who assumed the education brief in June following the shock resignation of Leighton Andrews, has come under increasing pressure to shoulder responsibility for Wales’ plight on behalf of the Welsh Government. “We need to be judged on how we turn this necessary rhetoric into reality,” he said. Mr Lewis last month warned it would be unrealistic to expect Wales to better its lowly position in Pisa, given the majority of actions taken to drive up performance had not had time to take effect. The question is whether Wales' most notoriously partisan Minister is prepared to take up this offer? If we are all to take responsibility then we must work cross party as well as throughout the educational system. I await developments in the New Year as to how this rhetoric is to be turned into action. The Spectator blog had a feature last week outlining ten good news stories from this year. I have termed this nine and a half because I am not sure that all-time high sales of the Spectator counts. They cite the fact that recorded crime has fallen to the lowest level in 25 years, that people think public services are getting better, in spite of substantial cuts in local authority spending. The doomsayers were wrong, they say, thanks to resourceful British public servants, more is being done with less. And, despite the trebling of tuition fees acceptances of university places are at an all-time high. They add that last year, 60 academics wrote a letter of protest saying the decision to treble tuition fees would lead to a drop-off of university students especially from poorer families. But poorer families are exempt from the fee, and acceptances of university places are at an all-time high. George Osborne has discovered what JFK called the “paradoxical truth” – that lower tax rates can lead to higher tax yields. The 50p rate was cut to 45p – and what happened? See below. An FoI request from The Spectator revealed earlier this year that the top 0.1 per cent – yes, the richest of the riches – now contribute more income tax than the bottom 50 per cent (who now pay less than 10pc of total income tax). Never have the lower-paid been asked for a lower share of income tax. Under a Tory Chancellor, the British income tax burden is more fairly spread than ever. The private sector have created two jobs for every one lost in government. As a result employment is through 30 million for the first time. What is more UK-born workers make up most of the jobs rise. Finally, the BNP is dying on its feet and despite the huge challenge of youth unemployment, smoking and drug use amongst the young is declining. We are far from out of the woods of course and there is much more to be done, but things have looked up for the UK over the past year. The challenge is to take that improvement and build on it in 2014. Having just been to see the second installment of The Hobbit, I think I could be forgiven for checking to see whether the film was still over when I read this piece in the Observer. It is common to see stories about 'elf and safety' at this time of year, indeed the sub-editors of local papers love them, however nobody expects an actual elvish intervention. It certainly provides food for thought. The truth is out there. A trawl of the pre-Christmas Sunday papers reveal a mix of doom, gloom and Abbey Clancy so thank goodness for the South Wales Evening Post, which has entered the spirit of the season with a list of the top ten Christmas apps you can download for your phone. Downloading apps is not something I do a lot but if you are that way inclined then you can do no better than one that offers you loads of recipe ideas and comes with a step-by-step video on how to make it. There is one that sorts out who pays what on the restaurant bill at the staff party, an app that can be used to scan the barcode on a bottle of wine to tell you whether it is one to avoid at all costs. It will also tell you if it’s good value for money, and an app that will help you choose your secret Santa present. And my favourite, an app that will guide you back to your car, via GPS, when you’ve finished your shopping. It will also count down the time you have left before you get slapped with a parking ticket. Despite a small blip when a Liberal Democrats spokeperson got above themselves, the party's response to Howard Davies' report on airport expansion has been fairly solidly dismissive of any plan to expand Heathrow. Mr Cable said: "What this report is doing – and it's actually a very well argued report as you'd expect from Howard Davies – we're trying to reconcile two different things; one is to try to ensure that from the economic interests of the country we have more connections to the big emerging markets, on the other hand we have hundreds of thousands of people in London living under the flight path with very serious issues of noise and all the parties have made it very clear we can't make that problem worse. The business secretary added that the Government should consider making better use of small regional airports across the country rather than focusing on a large expansion to stop all business travel being London centric. That is absolutely right and I am astonished that the report did not pick up on this. We really have to get this right and in my view, expanding capacity in the South East of England at the expense of the rest of the UK is not the way forward. As Christmas approaches, [INSERT AMs NAME] is backing Dŵr Cymru Welsh Water’s Let’s Stop the Block campaign in a special effort to avoid festive misery for people in [INSERT CONSTITUENCY NAME]. Blocked sewers are a major problem across Wales which costs Welsh Water over £7 million pounds a year to clear. They cause huge human misery, damage to homes and businesses, and can pollute our beautiful rivers, beaches and wider environment. The Let’s Stop the Block campaign aims to transform customers’ behaviours when it comes to putting things down the toilet and disposing of fat, oils and grease. This is a very serious issue of course, highlighting the danger of too much Christmas turkey. Please take note. With Labour failing to make any impact against the Coalition Government's economic policy the Sun reports that Ed Miliband is losing patience with his shadow chancellor. Relations between the two men have grown steadily worse in recent months as the recovery has gathered pace. Mr Balls also came under fire for his disastrous response to the Chancellor's mini-Budget earlier this month. A senior Labour insider told The Sun that Mr Miliband is "ruthless" enough to get rid of Mr Balls if it gives him the best chance of winning in 2015. The source said: "If we're still in difficulty on the economy by the time of the party conference in September, then he will do it. "You should not underestimate how ruthless Ed is. "He will not let anything stand between us and the election, and that includes Ed Balls." Possible successors include shadow cabinet members Chuka Umunna, Rachel Reeves and Douglas Alexander. This is all really interesting of course. The only question I have is whether Labour have planted story this themselves to make Ed Miliband look tough and decisive, or just to make it plain that he recognises that there will is a problem and is dealing with it. I guess we will just have to wait for September to find out. I do enjoy those increasingly more frequent moments when Nick Clegg, puts up his hand to some outrageous Conservative policy and insists that it cannot go ahead. It is at moments like these that we can all see quite clearly that the Deputy Prime Minister is a Liberal through and through. The Deputy Prime Minister said that the Home Office proposal to limit the number to 75,000 would damage the economy and lead to reprisals by other EU member states. He told a press conference: “My advice to the Home Office is to spend less time leaking policies that are illegal and undeliverable and spend more time delivering on the policies we have agreed as a coalition — notably the reinstatement of exit checks, which allow us to know who is coming into this country [and] who is leaving as well. “If we pulled up the drawbridge now and said to German lawyers, or Finnish engineers, or Dutch accountants that they can’t come to work, it would be a disaster for our economy. No matter what the rhetoric on this subject we should not forget that the British enjoy the same freedom of movement within the EU as we afford to others. Without it we could not have free trade and our economy would suffer. The Liberal Democrats have taken some stick from both Labour and the Conservatives for our scepticism and in some cases, out-right opposition to renewing Trident. The two old-parties want to spend billions of pounds on maintaining a level of deterrence straight more appropriate to the cold war, whereas the Liberal Democrats believe that we should be scaling back our commitment to these submarine-based weapons. Now the Observer reports on an important intervention by a former Tory defence minister. They say that James Arbuthnot, the veteran chairman of the defence select committee and a former defence minister, who is described as one of the Conservative party's most influential voices on defence has conceded that Britain can no longer be regarded as a "division-one military power". But the focus of his most startling remarks was the plan to replace Trident with four new Successor submarines, which a recent study by the Royal United Services Institute (Rusi) thinktank estimated would cost £70bn-£80bn to build, arm and support over their working life. David Cameron is a staunch supporter of a like-for-like upgrade and is expected to deliver an update on the Successor programme on Monday during a visit to the Royal Navy's nuclear base at Faslane. Arbuthnot said his views on the subject were changing and he was no longer certain that replacing Trident was the right move. The end of the cold war and a reshaping of the threats faced by the UK had undermined the logic of nuclear deterrence strategy, he said. "Yes, there has been a steady decline in my certainty that we are doing the right thing by replacing Trident. Nuclear deterrence does not provide the certainty that it seemed to in the past. It's not an insurance policy, it is a potential booby trap," he said. Arbuthnot voted in favour of replacing Trident in 2007, and said he would do so again now. But he admitted his views were changing. There was now a strong argument, he said, for abandoning the continuous at-sea nuclear strategy, which the UK has had for decades. "Nuclear deterrence is essentially aimed at states, because it doesn't work against terrorists. And you can only aim a nuclear weapon at a rational regime, and at rational states that are not already deterred by the US nuclear deterrent. So there is actually only a small set of targets. "With the defence budget shrinking, you have to wonder whether [replacing Trident] is an appropriate use of very scarce defence sources. You have to wonder whether nuclear deterrence is still as effective a concept as it used to be in the cold war." Arbuthnot said that if Russia wanted to attack the UK, it would not use nuclear missiles. "It would organise for a terrorist group to put a nuclear weapon on a container ship and sail it into Tilbury docks, with the signature of Pakistan on the nuclear device. "And what would the UK do? Launch a missile at Islamabad? We could not be sure against what we are retaliating. Nuclear deterrence does not provide the certainty that it seemed to in the past. It's not an insurance policy, it is a potential booby trap." Arbuthnot, who served in John Major's government, said doubts were growing about "the salience of a nuclear strategy at a time when the defence budget is shrinking". "The reason I would still vote for it is that I still want to walk softly with that big stick. By unilaterally disarming, we would be sending a message to countries like North Korea and Iran that we are losing our military will to fight. Our armed forces have not lost their will to fight." An interesting debate is now starting to develop. The Independent reports the devastating news that one can still be jailed for being a republican and that it remains illegal to even imaging overthrowing the Queen. The revelation comes as the Ministry of Justice embarrassingly admitted that a law threatening to jail for life anyone who has called for the abolition of the monarchy had been mistakenly included on a list of 309 offences due to be repealed before May. Although the law has not been used to prosecute anyone since 1879, it means that it is still theoretically possible to imprison for life anybody who even so much as "imagines" overthrowing the Crown or waging war against the Queen. Much more devastating is the news that “being an incorrigible rogue”, under the Vagrancy Act 1824, has also been repealed. What is the world coming to. For those of us worrying about the future of our planet following the extinction of the bumble bee, this article in today's Independent comes as a blessed relief. It is too early of course to celebrate but the sudden revival of the species is certainly good news. The paper says that a project that began as an attempt to reintroduce an extinct bumblebee to Britain has sparked a comeback by five other species whose numbers have dwindled alarmingly in recent decades. Pesticides have been blamed for killing off many bumblebees, which are vital as they pollinate fruit and vegetables – a free service worth some £560m a year to the UK economy. Seven of the 25 bumblebee species are considered threatened enough to be in the UK Biodiversity Action Plan. Five of these, the brown-banded carder, moss carder, red-shanked carder, large garden and shrill carder, have been found in increasing numbers at the reintroduction project in Kent. Short-haired bumblebee queens – brought to the UK from Sweden – nested this autumn for the first time in this country for 25 years. Conservationists began the project in 2009 by encouraging wild flowers to grow on a 20-hectare plot near Dungeness in Kent. They have now expanded this prime bumblebee habitat across more than 800 hectares in Kent and Sussex. The UK has lost over 97 per cent of its wild flower meadows due to agricultural intensification and urbanisation. The programme has attracted attention in France, where officials believe the researchers may have found a way to halt bumblebee decline across Europe. Cédric Vanappelghem, a conservation officer in northern France, said its “results are good”, and added that they were planning to study bumblebees there shortly. Given that none of us really have the time to go around pollinating flowers ourselves, the survival of the bumble bee is absolutely crucial. I am pleased that we are making progress towards that goal. Yesterday's Telegraph reviewed the Christmas cards of leading politicians and it did not like what it saw. Never mind selfies, the paper says that the first thing to notice about the Christmas cards of the three main party leaders is that they share a common theme. On the front of David Cameron’s card is David Cameron. On the front of Ed Miliband’s card is Ed Miliband. And on the front of Nick Clegg’s card is Nick Clegg. This week, the Christmas cards of our leading politicians have been released to the media, and, as usual, they themselves feature prominently in the designs. I suppose it’s understandable. After all, the sort of people politicians send Christmas cards to are the sort of people who will want to show them off. A card with a nativity scene or a chortling Father Christmas would be no use. It would be indistinguishable from a card sent by an unimportant person. 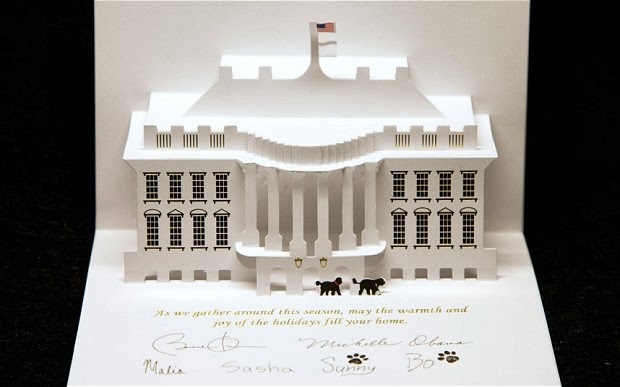 If anything, politicians’ Christmas cards are designed to appeal not to the vanity of the sender, but the vanity of the recipient. A bit harsh perhaps but at least David Cameron is not sending out a pop-up model of the House of Commons, the UK equivalent of Obama's card as shown below:. Now that would be worth displaying on a mantlepiece. At last some commonsense on MP's pay with the The Times reporting that the three party leaders have united to call on IPSA to rethink their proposal of an 11% pay rise. The paper says that they are prepared to back a Commons vote, or even a new law, designed to head off the pay increase for MPs, formally announced by the Independent Parliamentary Standards Authority yesterday. Although this will once again put the fate of MPs remuneration back into their own hands, it is the right thing to do, at least until IPSA start to understand the economic and political climate they are working in. 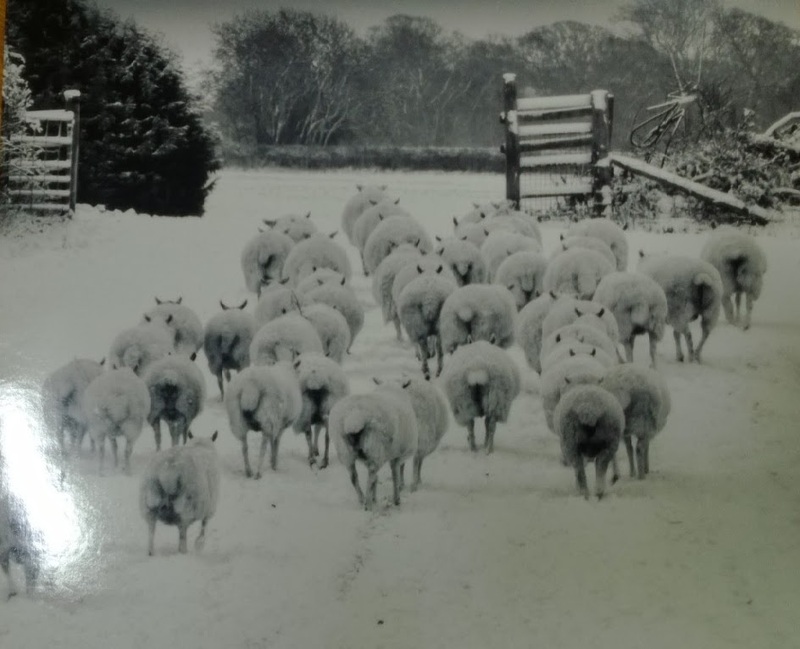 A Christmas card arrives from the Wales Office, signed by all three Ministers. On the front is a very Welsh photograph of sheep being herded from a field in snow. 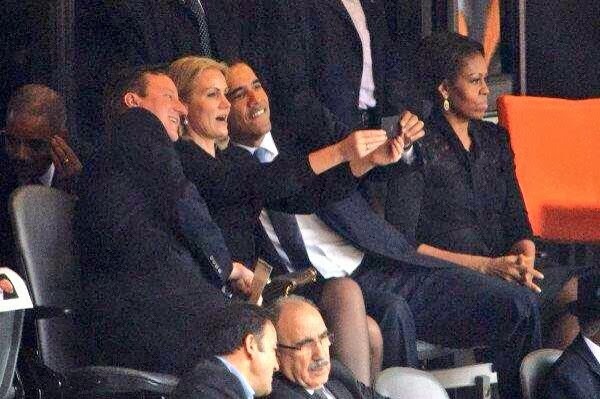 Which is the most important picture from the Mandela commemoration event? All the newspaper this morning are running this photo of Neil Kinnock's daughter-in-law and Danish Prime Minister, Helle Thorning-Schmitt taking a selfie with David Cameron and Barrack Obama at the Nelson Mandela Commemorative event at the FNB football stadium in Johannesburg. In my view it was disrespectful, even if it does show that our World Statesmen are just as starstruck on each other as everybody else. For me though the picture that really mattered was the one of Obama shaking the hand of the Cuban President, Raul Castro. If that is the start of a thaw in relations between the USA and Cuba then it will be very signicant indeed. The Labour Party is looking to recruit a number of Outbound Communications Agents to work in the Head Office based in Newcastle (part-time, 12 hours per week - evening work). Applicants should thrive in a targeted and fast-paced environment, have the ability to adapt to new projects and have excellent interpersonal and communication skills. Please note this is a fixed term contract until one day after the next General Election. In my day this job was called telephone canvassing. Peter Black: Minister, the latest PISA results have shown that the outcomes for pupils in Wales in relation to basic skills is particularly poor. What will you do in the next six months to convince employers who wish to relocate to Wales and create jobs here that they have a high-quality workforce that they can call on to turn this around? Huw Lewis: As we have discussed, within the next six months, we will see a radically reformed school improvement structure across the country, so that every corner of Wales, every teaching professional, certainly, and every school leader will see a completely revamped structure of support and challenge all around them. This will be the single most important vehicle in terms of driving this agenda forward. The BBC reported on the same day that business leaders in Wales are warning of a skills shortage in the wake of these school tests which show that the nation is falling behind its industrial rivals:. Emma Watkins, director of business group CBI Wales, said basic skills was one of the top issues firms raised. "It's fundamental that the skills system, the education system, is meeting the needs of the economy. Are we doing that? No. Not enough yet." She argued that businesses should be expected to pay to train people in specific skills required by the company. But she added: "There are still too many businesses out there who are having to invest time and money and resources in teaching people to read, to write, to answer the phone, which frankly they shouldn't be doing." This remains a huge concern of course, The damage that we have to repair as a result of the Welsh Governmeent's failure is not just in the education system but in our reputation with business and those who would employ people here. All the media this morning continues to run with the weekend story of an 11% pay rise for MPs. Quite rightly this headline has caused huge public outrage. What we do not know yet is how this forms part of the full package. There is talk of changes to pension arrangements and expenses that will make the pay rise revenue neutral, in which case, why bother? The politicians are caught in a classic dilemma. Almost unanimously, they know how bad this looks and are prepared to forego the rise, and yet as a consequence of the last expenses scandal they have handed over control of these issues to a group of bureaucrats who, seemingly do not have the same sensitive political antennae. The point is that no matter how justified this rise is when comparisons are made with other professions, no matter what mitigating factors there are, and despite the previous freeze in MPs salaries this rise in salary cannot be justified when consideration is taken of what is happening out in the country. By all means keep MPs out of decisions affecting their own remuneration, but please make sure that the body who is doing that job has some political nous and understand that their job has much a wider impact than just the 650 Members of Parliament who they work for. Does Labour's record in Wales bode ill for the UK? Toby Young had a particularly scathing comment piece in Friday's Telegraph in which he takes a long hard look at 14 years of Labour hegemony in Wales, and decides he does not like what he sees. More importantly for Ed Miliband he extrapolates Labour's disastrous record on health, the economy and education and suggests that it makes them unfit to form the next UK Government. The poor showing of Wales in the Pisa international league tables published earlier this week is a reminder of just what a mess Labour has made of the Welsh education system. In 2006, Welsh schoolchildren were ranked 30th in maths, 29th in reading and 22nd in science. In the latest tests, they fell to 43rd in maths, 41st in reading and 36th in science. Wales isn't simply the worst performer in the UK, it's well below the OECD average. The blame for this pitiful state of affairs can be laid squarely at the feet of the Labour Party, which has been in charge of education in Wales since 1999. The education reforms that successive governments have introduced in other parts of the UK in that time have left Wales largely untouched. League tables were abolished in 2001 and not a single academy or free school has been set up. As the Economist points out in this damning analysis, parental choice in Wales is limited to deciding whether to send a child to a school where lessons are taught in English or Welsh. The country has indulged in what David Reynolds, an educationalist at the University of Southampton, describes as “producerism's last hurrah”. Hardly surprising, then, that 26 per cent of the Welsh population over 16 have no recognised qualifications, according to the 2011 census. But education isn't the only devolved area that the Welsh National Assembly, which has been Labour-controlled since 2000, has messed up. The Welsh health system is, incredibly, even worse than the Welsh education system. As the Prime Minister pointed out in the House of Commons earlier this year, the Welsh NHS hasn't met a cancer target since 2008 or an A&E target since 2009. (FactCheck confirmed the first of these claims here.) The picture is no better when it comes to waiting lists. Between March and September of this year, the number of patients waiting more than nine months for treatment in Wales more than doubled, increasing from 5,414 to 11,672. The Welsh Ambulance Service has failed to hit its target of responding to 65 per cent of the most urgent calls within eight minutes for the past 16 months. So there you have it. Thanks to 13 years of Labour misrule, Wales is the sick man of Europe – quite literally. According to the 2011 census, roughly a quarter of the Welsh population claim to have a "long term health problem". Its education system is a basket case, its health service is a death trap and its economy is in the toilet. If this is the future you want for the rest of the UK after 2015, vote Labour. First Minister, Carwyn Jones may be the most senior elected Labour figure in the UK, but that position also carries a huge potential problem for Ed Miliband. Labour's electability in 2015 could be judged by many people on what happens in Wales. If the Welsh Government continues to fail in key areas such as health, education and the economy then many might conclude that Labour will have the same negative impact in Number 10. Hitting them where it hurts? The Times reports that a new code of conduct for the House of Lords is proposing to extend the sanctions that are available to use against those peers who misbehave. The new rules would ban peers who have misbehaved from claiming any money from the House of Lords. In addition, such peers would be forbidden use of amenities within Parliament, including IT and library facilities, car parking, meeting rooms, desk space and stationery. They would also forgo dining and banqueting rights. Although a suspension can only be enforced for a limited period, the sanctions could be applied for any period of time. They could be used to deter disgraced peers from attending the Lords. In contrast to the Lords rules, MPs are automatically disqualified from the Commons if they are jailed for more than a year. Take away their dining rights! That should do it. If ever there was a sign of an archaic institution that needs reforming this is it. The father of a nation, a giant amongst men. We will not see his like again. The evidence given by former First Minister, Rhodri Morgan to a House of Lords committee investigating coalition governments is worth reading if only to gauge the mood within the Labour Party immediately after the 2010 General Election and the problems they had in taking negotiations with the Liberal Democrats seriously. Mr Morgan said he thought it was “odd” that his experience was not put to use. In his written evidence to the peers, Mr Morgan advised party leaders to stay out of direct coalition negotiations. The comment about Alpha-Males is especially illuminating as it seems that Labour's negotiating team in 2010 was dominated by this particular specimen. Perhaps a lesson for Labour in 2015. The South Wales Evening Post is very exercised by the proposal by Amazon to one day use unmanned drones called Octocopters out of their Jersey Marine fulfilment centre to deliver goods to customers within 30 minutes of them being ordered. I had to check the date, but no, it is not April 1st. "We can do half-hour delivery... and we can carry objects, we think, up to five pounds (2.3kg), which covers 86 per cent of the items that we deliver." The service will be called Prime Air and will get around that annoying thing about online shopping - having to wait a day at least before receiving what you have ordered. Amazon has even posted a video on its website showing a drone picking up a package from one of its warehouses and delivering it to the doorstep of a customer's house. O.W.L.S. consists of a fleet of specially trained owls that, either working individually or as an adorable team, will be able to deliver your package within thirty minutes of you placing your order. Putting O.W.L.S. into commercial use will take a number of years as it takes ages to train owls to do anything and we only just thought of it this morning. Q. Isn’t this just what they did in Harry Potter? A: Yes, this is exactly what they did in Harry Potter. You’re asking that as if this is a bad thing. Q: Won’t this be really expensive? Have they told J.K. Rowling? I have an article on the Wales Eye website on homelessness and the Welsh Governmnt's proposal to scrap the priority need category for ex-prisoners. Social media has many uses, but one I had not considered before is to help track down evaders. According to this website, Her Majesty's Revenue and Customs Inspectors are increasingly turning to Google Street View as a monitoring tool to catch suspected tax evaders. Street View provides a kerbside view of homes and businesses, giving inspectors a quick way to assess a person’s lifestyle and see whether it matches declared income. In one case, the firm revealed Street View was being used to provide clues as to whether a family was using a private school, thanks to the practice of advertising school fêtes on signs in parents’ gardens. Roy Maugham, UHY Hacker Young tax partner, said: “HMRC believe there’s a big discrepancy between what people are earning and what they are declaring, which is driving a massive push to recoup some of the loss. “They are using every possible bit of information that the internet is making available, and Google Street View is being seized on as a quick and cheap alternative to visiting someone’s home,” he said. Officials are also looking for home improvements or expensive cars parked in the driveway as clues to earning levels. Ingenius or just downright disturbing? There is no doubt in my view that at some stage we will have to address the issue of whether there are enough Assembly Members to properly run a legislature. This is not about the workload of individual AMs. It is about whether there is enough time in the working week for all the committees and Plenary to do justice to the policy, scrutiny and law-making job they have been given. To do it properly there needs to be more Plenary meetings and more committee meetings, but unless we have more Assembly Members then these bodies cannot be populated, simply because members are already engaged on other committees. However, this is not the time to press it, simply because there is no consensus for such a change and, in times of economic hardship, when we should be focussing on cost of living issues instead, our constant obsession with the size of the Assembly and its powers looks self-serving. Mrs Morgan also called for an overhaul of the committee structure, saying a decision by the Labour Chief Whip Janice Gregory to replace her and two other members of the Children and Young People’s Committee in April at very short notice, allegedly over a Plaid Cymru proposal to write the issue of writing a smacking ban into the Social Services Bill, was an example of something that could not happen in Westminster. Actually, none of these are good reasons to increase the number of Assembly Members. The fact that half the Labour Group are on the Government payroll is their choice. It has not always been thus. If Julie Morgan has a problem with that then the person to address her complaint to is the First Minister. There is nothing to stop Labour backbenchers engaging in constructive scrutiny or holding the executive to account, indeed one or two of them do so rather effectively. The problem is when it comes to legislation they meekly accept the whip on issues they have felt very strongly about at stage one. The fact is that even with 80 members the same culture would prevail. That is because Welsh politics is tribal by its nature and it is still easier to control a small group of 30 to 40, squashed into one building than it is one of 250 to 350 spread out amongst several office blocks around Westminster. There is no committee structure that would prevent Labour whips acting in the way they did on the Children and Young People's Committee. Even in Westminster, whips make sure that troublemakers do not get on to Bill Committees. The fact is that when we start to look closely at this call for more members, it is not about the size of the Assembly at all. It is about the control-freakery of the Welsh Labour Party. It is a culture Julie Morgan and others have been part of all their political lives. Thank goodness some are now starting to question it, even if only by proxy. I don't often look at the disclosure log on the Welsh Assembly website, detailing the responses to Freedom of Information requests. It makes a fascinating read, not just for answers but for some of the queries too. As we have just celebrated the 50th anniversary of Dr. Who I particularly focused on the question as to how much the Welsh tax payer received as a result of renting out the Senedd for filming Dr Who episodes? The answer it seems is not a great deal. The response is that the Assembly is keen for the Senedd to be used as widely as possible in ways that might benefit Wales and the Assembly. It therefore does not request fees from broadcasters for filming carried out on the estate, unless the filming would result in additional costs being incurred by the Assembly. They add that the Assembly’s view in this respect has been that it is beneficial to encourage TV coverage: Accordingly we did not receive a fee or income for the filming of Dr Who. Given the publicity and benefits that Dr. Who brings to Wales it seems that this policy of doing all we can to assist filming is paying off.